Sal, Samson and Eddie venture out to Banning, CA a.k.a (Bumfook nowhere, meth capital of the world). 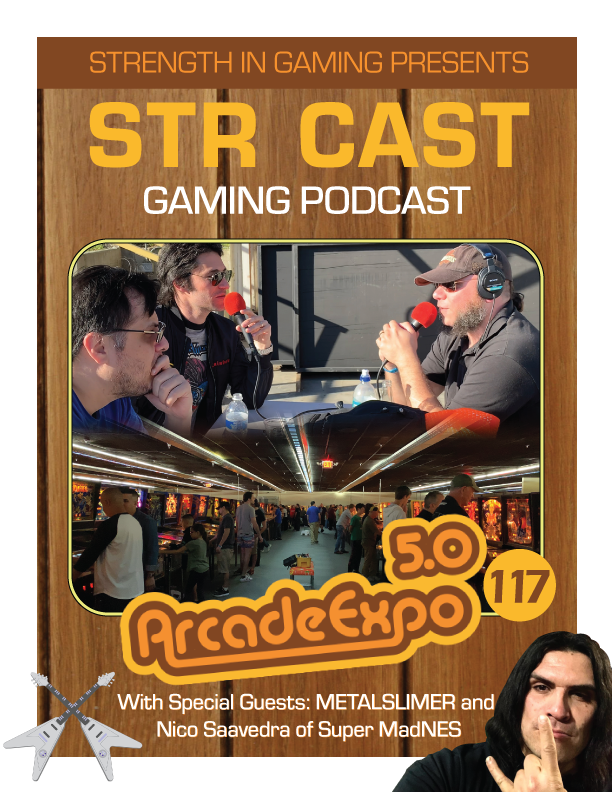 Once again, STR CAST hits the scene for their third year at Arcade Expo! Why? Because, Arcade Expo is the absolute best place to play your favorite pinballs, and retro arcade cabinets! So, for the low low price of 60 to 70 bucks a day you get unlimited free play on thousands of machines! And, we run into our good friend Nico Saavedra of Super MadNES! In addition, we had the amazing opportunity to interview the most KAWAII, CUTE and BRUTAL cosplayer ever to grace the cosplay scene, METALSLIMER! Also, It should be noted, METALSLIMER has the most metal legs. Arcade Expo is the largest Pinball and Classic Arcade Expo in the world. Located in Banning, California about 1 hour from Los Angeles. The Expo happens once a year in March. The Venue: The Museum of Pinball is a nonprofit organization committed to the preservation of pinball, video arcades, and other playable art forms. We utilize a hands-on immersive program and events devoted to the celebration of the past and present of gaming culture to develop, nurture and secure a growing interest in the future of gaming, art and it’s culture.